Anyone who listens to pop music must have at least heard of Sam Sparro's 'Black & Gold'. If you haven't listened to it yet, we strongly recommend you do. And, we felt our image could not have a more perfect title. The inspiration for this scene comes from the movie 'The Hobbit: Desolation of Smaug' where the Dwarves try to immolate a dragon by drowning it in molten gold. That gave us the idea of rendering liquid gold. 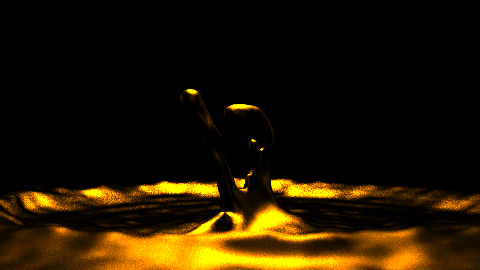 So, in this image we tried to depict a scene where we show a snapshot of the splash when a drop of gold has been dropped into a volume of liquid gold. We made the base model from scratch in Blender. 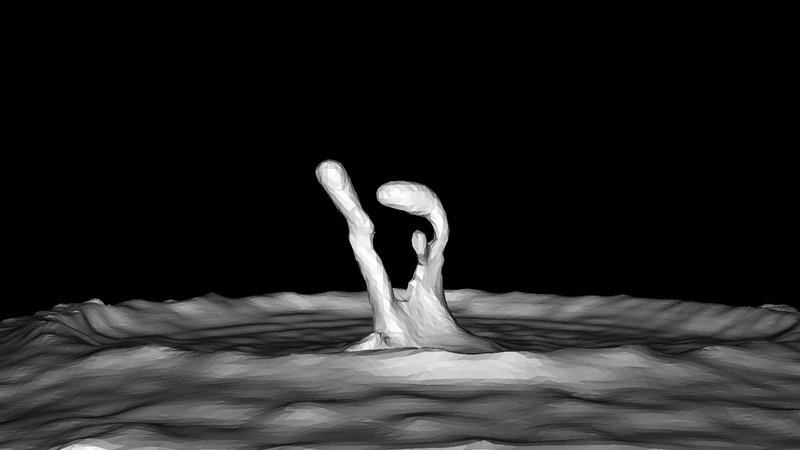 We used the Blender physics engine to actually model the fluid physics of a waterdrop falling into a vat of water. Blender will return a series of 3-D models, each modelling the physical state of water at consecutive time steps. We then selected one 3D model and we exported it as an .obj file. We followed this tutorial to render fluids in Blender. Finally, this is an image of the base .obj file we used. We used a phong material with an exponent value of 9. That gives the material a metallic look. We tried modifying the eta and kappa of the mirror material, but the renderings were not how we wanted it to be. So, we just stuck to phong material. We first tried using area lights for the lighting, but we found out that they were a bit brighter than we expected and the shadows were a bit too muted for a given strength of light, whereas we wanted stronger shadows but also highlighted details. So we made our own version of the area light. Our lights don't have the same strength over the whole area, but is spatially varying over the light area. The intensity is the strongest in the center, and it gradually decreases when we move away from the center according to a Gaussian function. This gave the stronger shadows that we wanted and we also get a tighter area of illumination. We used 6 Gaussian lights for the scene. 4 of them form a T shape above the scene and 1 each on the left and right. We have used a depth of field camera with the focal plane on the splash pillar. We figured that by using depth of field, the viewer's observation will be concentrated on the area around the pillar. But we kept the radius of confusion on the low side so that the image doesn't get too distorted. Finally, as post-processing, we just did a slight gamma correction with a gamma value of 1.1. We just did it to bring out the details a bit in the shadow regions. The gamma correction is done in the renderer, right before we set the pixel value. This is the final rendering that we have submitted. The high-res 1920 x 1080 image with 100 samples per pixel, took 5.5 hours and the low-res 480 x 270 image with the same number of samples took about 20 minutes to render on an i3-2348M processor running Ubuntu 16.04 LTS with 8GB RAM. The website template that we used can be found here. Also, as Firefox does brightness range compression on images for optimisation, the images look a tiny bit darker than the source images. Therefore, we recommend Chrome to view the site where the images look closer to the originals, or the images can be downloaded and viewed outside Firefox.